Have you ever been Interested in a charter boat or fishing guide but not sure where to begin? ​View the map and/or table below to locate charters and guides available throughout the State. Just click on a map marker to view contact and other helpful information. 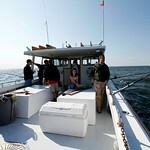 Additional charters and guides are added twice a year, normally once in April and again in October. Captains and Guides - If you would like to participate and have your charter boat/guide services on the website, please complete the application for the Charter/Guide Website Listing on the Charter home page. If you would like to become a guide​ or want to find out what to expect from your hired fishing guide, please look at the flowchart. The map is updated twice a year (April and October) after information is verified. The map below is currently being updated, we are now accepting new submissions until March 31, even if you submitted information previously please resubmit via the application. The information depicted on the map and table below is submitted voluntarily and may not be correct or up-to-date. Additionally, the locations depicted are based upon the marina or business address supplied and may not be accurate. Always call ahead if you're interested in a particular party. THE MARYLAND DEPARTMENT OF NATURAL RESOURCES MAKES NO WARRANTY, EXPRESS OR IMPLIED, INCLUDING WARRANTIES OF MERCHANTABILITY AND FITNESS, FOR A PARTICULAR PURPOSE OR ASSUMED LIABILITY FOR THE ACCURACY, COMPLETENESS OR USEFULNESS OF INFORMATION ON THIS PAGE.